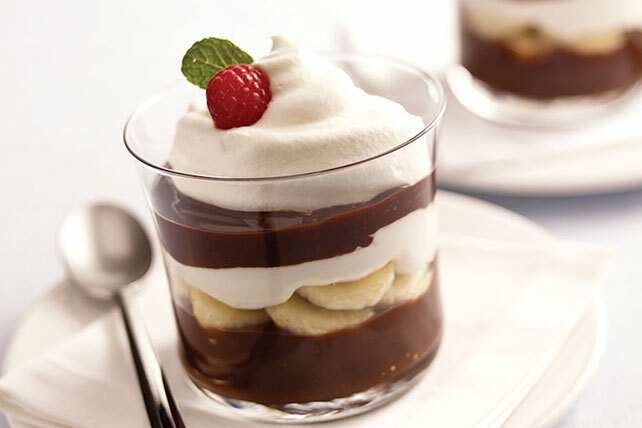 Fall head over heels for these Low-Fat Chocolate-Banana Parfaits. These Low-Fat Chocolate-Banana Parfaits are pretty to look at and delicious to eat! Spoon half the pudding evenly into 4 dessert glasses; cover with layers of bananas and half the COOL WHIP. Top with remaining pudding and COOL WHIP. Layer a JELL-O Sugar Free Pudding Snack with half a sliced banana and 2 Tbsp. thawed COOL WHIP LITE Whipped Topping in parfait glass or dessert dish. Prepare using COOL WHIP FREE or COOL WHIP Sugar Free Whipped Topping.